In Irish lore, plants are believed to have special powers. 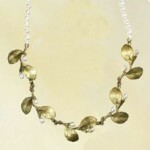 You'll feel special when you're wearing this stunning display of Irish Thorn leaves and pearls around your neck. Cast of hand-patinaed bronze with freshwater pearls. Proudly made in the USA.